The objective of Memory Grid is to match together syllables that are represented by cards. But why do the syllables sound a little unusual and why were these particular syllables selected by our scientists for matching, you may be wondering? The reason is that Memory Grid is improving memory by sharpening auditory processing rather than simply challenging your brain to match an increasing number of syllables. One of the most important memory building blocks is auditory processing. Your brain can only store information accurately and recall clearly later if the information was taken in with crystal clarity. However, without even knowing it, some of us have difficulty taking in what we hear with complete clarity. Improving your brain’s ability to separate individual auditory events. Improving your brain’s ability to perceive and transmit sound precisely. Improving your brain’s ability to record and interpret sounds accurately. Consider once again the word “bed”. The brain’s neurons can represent and assemble the word ‘bed’ most accurately when the individual sounds /b/, /e/, and /d/ are transmitted with precision to the auditory cortex. The next step can be assigning meaning to the word ‘bed’ based on our past experiences. So the word can go from the auditory cortex, which is one of the sensory cortices, to the other sensory cortices and the associative cortex to be associated with many other experiences. 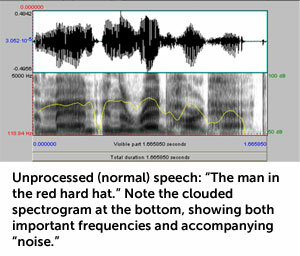 The brain will be better able to record the word ‘bed’ and relate it to other experiences based on the precision and accuracy with which the sounds for the word are initially transmitted and received. Recalling this information about the word ‘bed’ in the future will be easier because the brain will be better able to remember the word and will have a crystalline representation of the word’s meaning. Brief speech events that change quickly and are difficult for the brain to take in - such as consonant sounds - are separated and exaggerated. To prevent muddying or masking of brief consonant sounds, the long, strong sounds – primarily vowels – are weakened. The brain can improve its capacity to isolate auditory events in speech through recurring practice that engages the appropriate processing machinery. 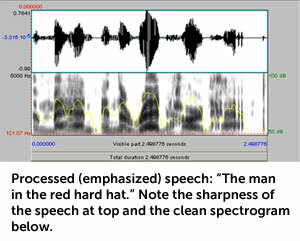 Processed speech is not trying to make speech more intelligible. This is a common misconception. In fact, people may discover that normal speech is actually easier to understand than processed speech. The processed speech is used to target the auditory cortex and cochlea in order to renormalize the neurons and ultimately re-teach them to separate auditory events.